These are my top tips & recipes to host the best derby viewing party, guaranteed! Decor, inspiration, classic food & drink, all right here! 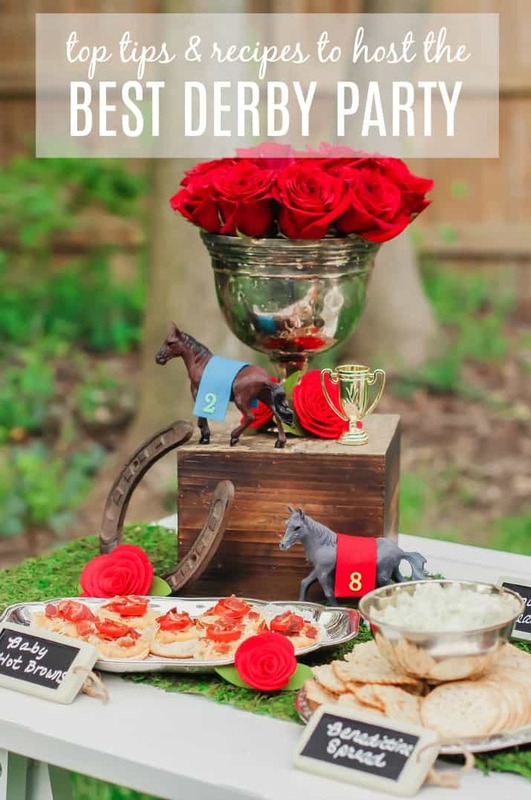 I’m going to just be bold here and declare this to be the best list of ideas for hosting a fantastic Kentucky Derby party. 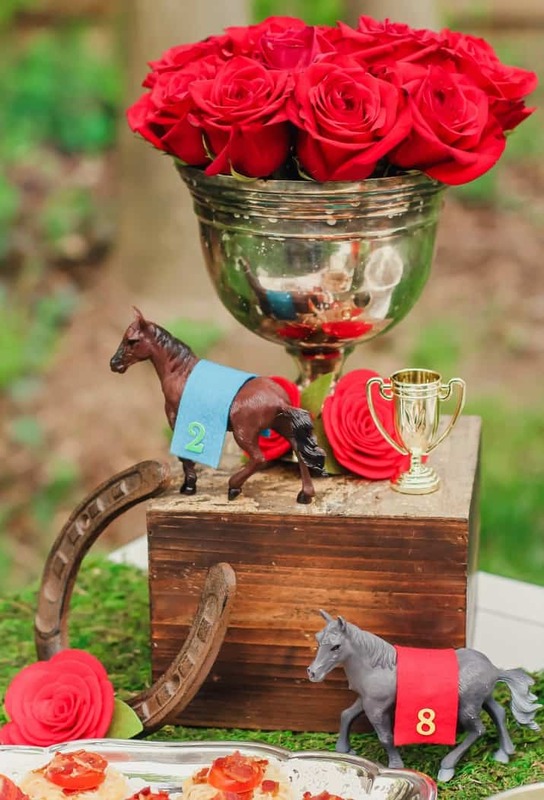 That’s right, you can add an embellishment here, or a banner there, but if you include the ideas shared here you’ll cover all the important bases for a derby viewing party including horses, roses, bourbon, hats, food, and more. What’s more is that you won’t go crazy trying to pull it all together by the end of the week. 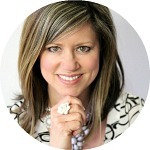 Items are easy to access, and set up is a breeze. A good thing since the race itself only lasts 2 minutes! HA! Gather together a couple of hours before so you can build up anticipation, have some cocktails, and place your bets. Cover the refreshment tables with moss runners from the craft store. They will emulate the field and provide a fantastic base for food and drink. Pick up toy horses from the Dollar Tree and add numbered sheets to their back like the horses wear in the race. Simply cut a rectangle of felt fabric and attach a number stickers to the sides. Place a few horseshoes on the table. Place a dozen red roses inside a silver urn or trophy cup. Make sure the ladies wear large, over the top hats! The gents can also wear hats and bow ties. Use hats as decor too. Place 1 or 2 on a tall stand. Here I used a wreath stand to anchor one end of the table with height. 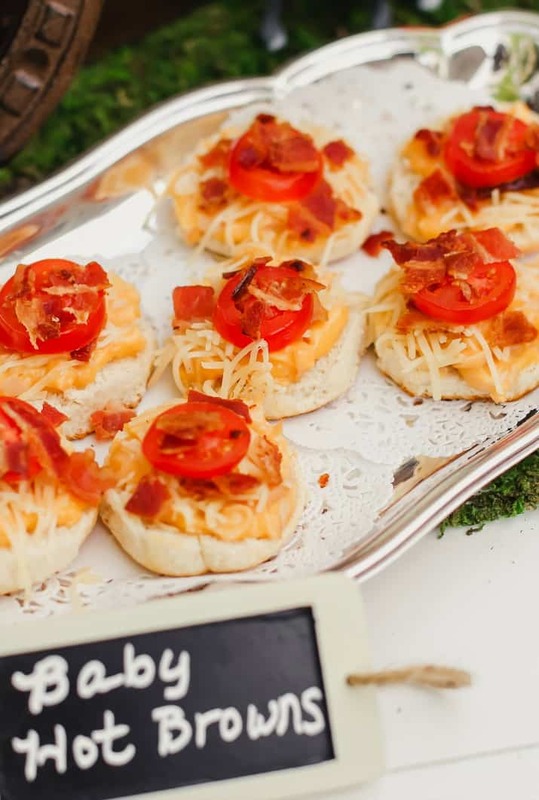 Serve these quintessential derby dishes to your guests: hot browns, benedictine spread, mint juleps. The recipes are provided below. Cook biscuits according to package directions. Let cool and slice in half. Set aside. To make cheese sauce, melt butter in a saucepan over low heat and add flour. Cook, whisking constantly, until smooth. Gradually whisk in milk; cooking over medium heat, whisking constantly until mixture is thickened and bubbly. Add Cheddar cheese, while whisking until cheese melts. Stir in diced turkey, salt, and ground red pepper. Top biscuit halves with cheese & turkey mixture. Sprinkle with Parmesan and half of bacon. Cook at 375 degrees for about 5 minutes or until Parmesan is melted. Remove and top with a slice of tomato and sprinkle with remaining bacon. Make this benedictine as a dip or a spread. 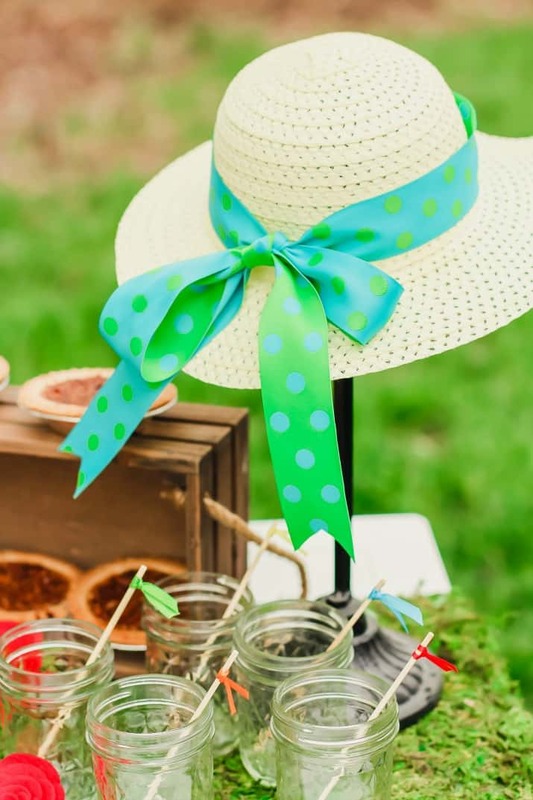 It’s a southern tradition at parties, from baby showers to bridesmaids luncheons. It’s also terrific to make stuffed cherry tomatoes as part of an appetizer buffet. Drain all the moisture out of the grated cucumber and pat dry with a paper towel. Do the same with the onion. Combine all ingredients in a bowl and mix well. Cover and refrigerate a couple of hours or over night so flavors can marry. Serve as a dip for crackers and veggies, or spread on white bread to make small tea sandwiches. Cut off crusts and serve. I also suggest you serve these bourbon meatballs Everyone loves them and bourbon IS part of the theme here! 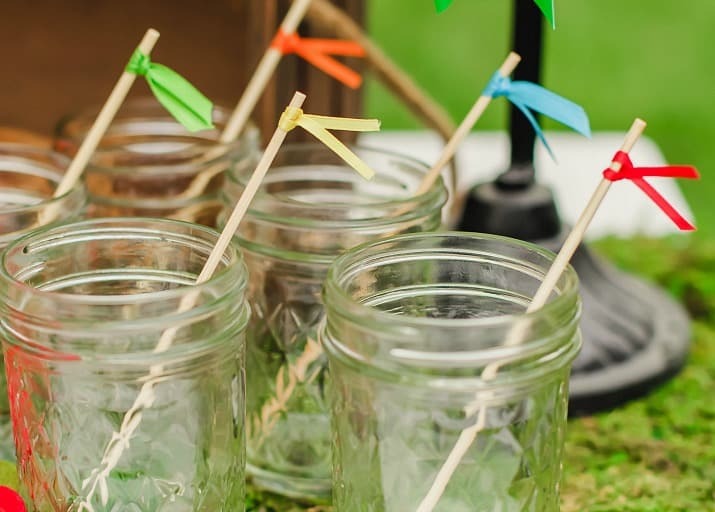 Make these easy “jockey whip” drink stirrers. Use thin ribbon in different colors and tie them on to the ends of wooden skewers for a decorative touch to the glass. I don’t know anyone who has enough silver julep cups for a party. I think the next best thing to do for a crowd is to use 8 oz. canning jars. They keep that Southern feel and they’re economical too. Naturally you’ll want to serve mint juleps. Use this classic recipe made with mint simple syrup. Make the mint simple syrup by combining the water, sugar, and mint in a sauce pan over medium-high heat. Bring to a boil for 5 minutes. Let syrup cool for at least 20-30 minutes before removing mint leaves. Transfer syrup to a small pitcher or bottle, cover and refrigerate over night. 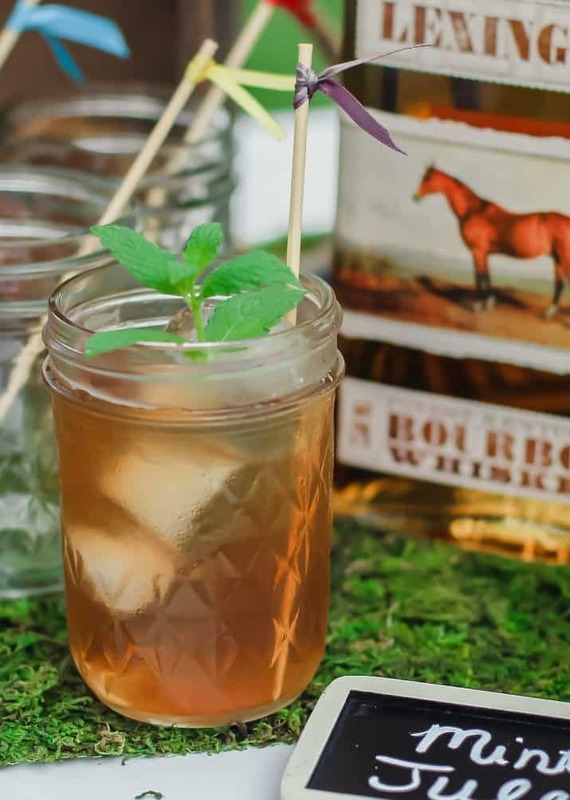 Make one drink at a time by adding 1 tablespoon mint syrup with 2 ounces of bourbon over ice. Stir to combine and chill. To change things up a little try these Southern Kentucky Mule cocktails. 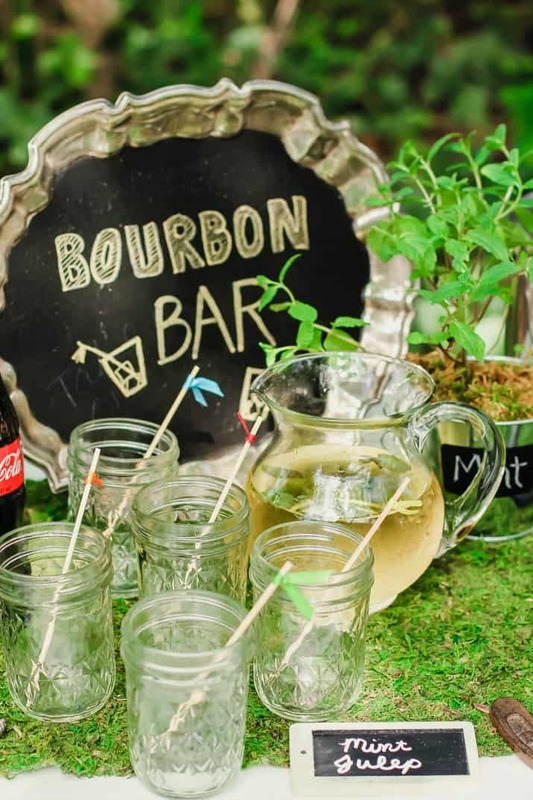 For added fun, set up a bourbon tasting bar and let guests try some new flavors. 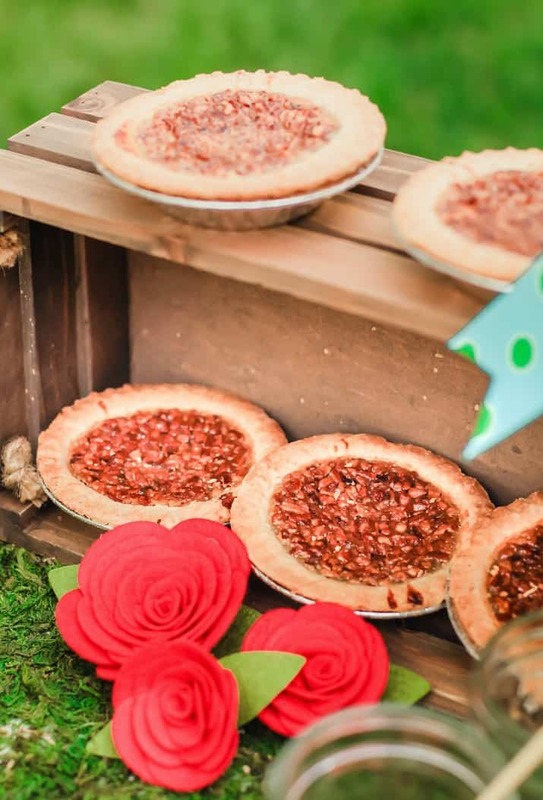 Bourbon pecan pie is a derby classic, but why not serve it with a twist? Bake the filling in mini pie shells so guests can grab and go. You can use muffin tins for the perfect portion size, or you can “cheat” by picking up some minis at the bakery. 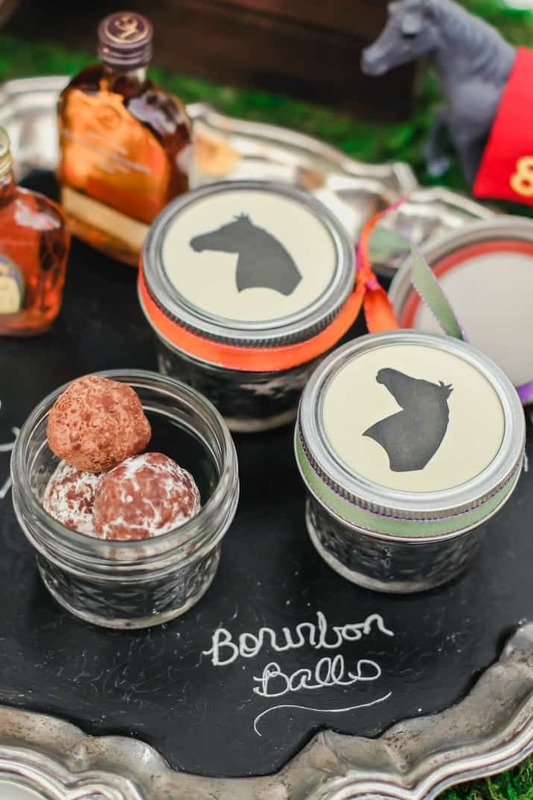 Whip up a batch of bourbon balls to serve on the sweets table and to package as guest party favors. These bite size desserts can be made up to a week ahead of time. 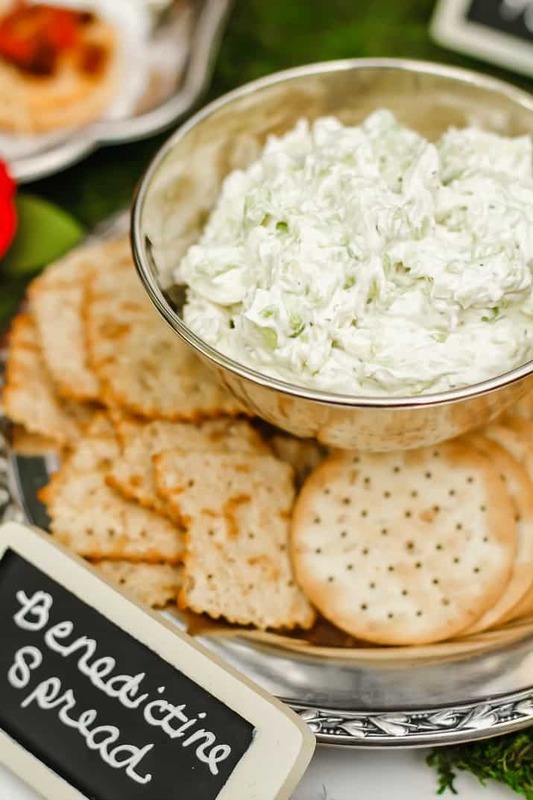 This mint julep dip sounds tasty too. I think you can make it with or without the bourbon added. Win or lose the race, send your guests home with themed favors. 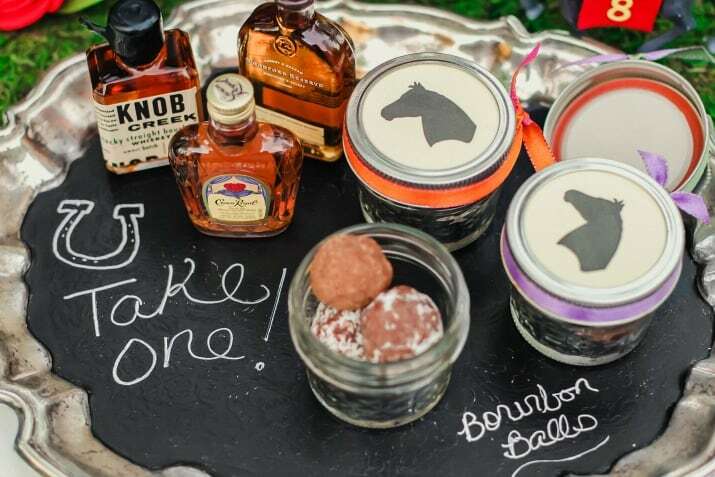 Mini bottles of bourbon are a great take home gift for the guys, while packaged bourbon balls are a treat for the girls. Will you be hosting, or watching the race on Saturday?